After a lovely Wednesday with plenty of sunshine what’s in store as we enter our meteorological Summer. Outlook: Low pressure to our north at times and high pressure to our south, so basically a sunshine and showers mixture. Perhaps breezy at times and temperatures around normal or just below with some cool nights. As always the British weather is very changeable, so keep up-to-date with your local weather by following @ChadWeather on Twitter. After some welcome rain last week, it’s time to turn up the heat as we experience our first taste of Summer temperatures. However, after initially hoping it would last all weekend, it is now looking like Friday will be the warmest day with a cooling trend over the weekend. High pressure has built in across the UK as this week has gone on and with it comes some very warm and humid air from the southeast. Follow @ChadWeather on Twitter for the very latest weather forecasts. Well the rain certainly returned this week and all of a sudden everywhere looks green and is growing. It was much-needed rain but it’s already time the sun returned. Quite a complex set-up these coming days with timing tricky on when it will rain etc. ; as always is the case with showers. Any clear spells overnight will lead to quite chilly conditions and even though the risk isn’t that high, we could see the odd rural groundfrost. 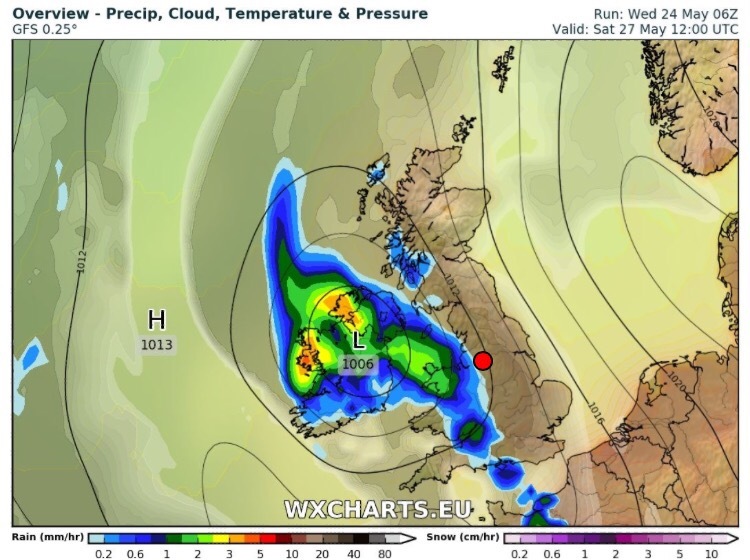 Outlook: Showery then hopefully high pressure will build and kill off the showers and allow for some sunshine. However, it doesn’t look set to last with showery conditions returning. Remaining fresh. After only 20% of the monthly average rainfall in April we’re now 11 days into May and we’ve had zero rainfall, but that’s all about to change. Headline: We lose the very dry and settled conditions that we’ve had for several weeks as the weather changes to come from the more usual west/southwest direction. Outlook: Remaining warm with temperatures well into the teens with sunshine and showers. Nights will be less chilly after we experienced some ground frosts this week. The lack of rain continues after what was an expectionally dry April where we only received 20% of the month’s average amount. 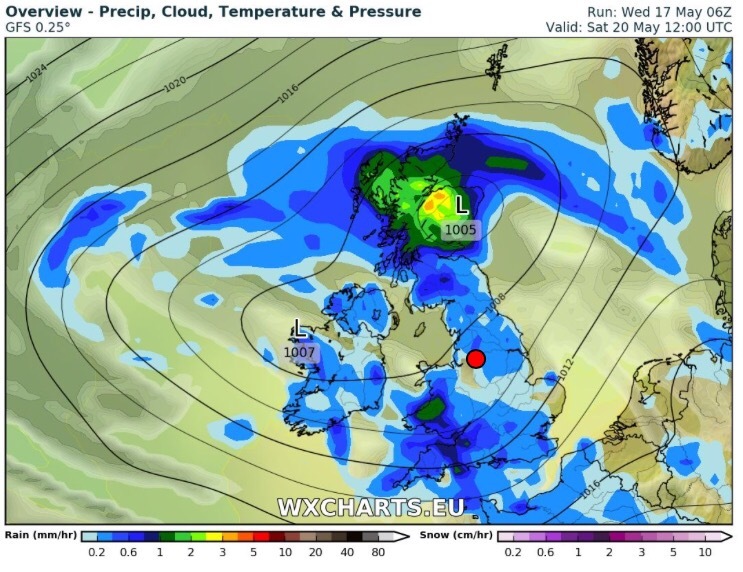 Only 14.4mm of rain fell, and with this forecast in mind, it’s time to start watering those gardens. High pressure anchored to the north of the UK will be close enough to maintain dry and pleasant weather for the forthcoming days. However, it will be breezy at times and that wind will be chilly. Warm by day but some cool nights where skies clear. The UV is at 6 now, and the sun is as strong as it is in August, so slap on that suncream. 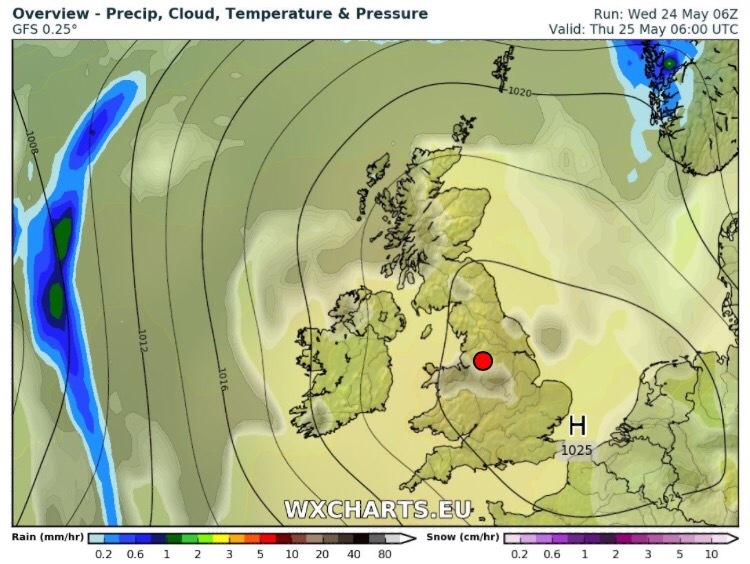 Outlook: Slowly next week the high pressure will slip away and more cloudier skies will come in from the north with slightly cooler air for time. Apart from the odd shower the lack of any widespread rain remains. Follow @ChadWeather on Twitter for all the latest forecasts.